“What beautiful roses!” The clerk mentioned, as she rang up my groceries. “Thank you.” I thoughtfully replied. Oh the look of dismay and confusion that followed. Dustin claims that my response required an explanation, but I left it there. Right there. Hey, I had kids and groceries, and kids. I promise there’s a perfectly good explanation for my answer. And since this time of year is the season for love and flowers, why not discuss a new purpose for the prized rose? Rosewater is simply a flavored water that’s created by distilling the petals of the rose with steam, or steeping the petals in water. The result is a fragrant liquid that boasts anti-inflammatory and anti-bacterial properties. 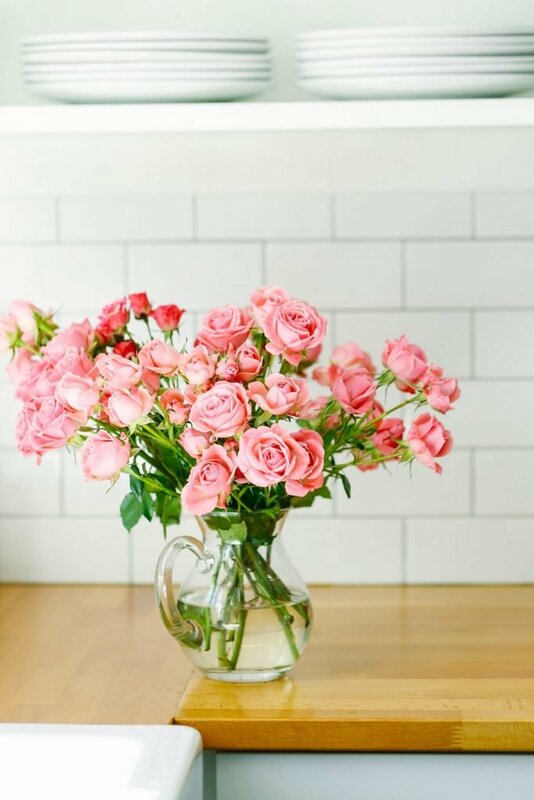 Thanks to these anti-inflammatory and anti-bacterial properties, rosewater has been hailed as an amazing skin spray, toner, and a wonderful addition to lotions and creams. Who wouldn’t want to walk around smelling like a rose field all day? I’ve been hearing about rosewater for quite some time, and I’ve even used it in a hydrating spray during the summer, but it wasn’t until my spa visit a couple of months ago that I truly began to understand the benefits of using rosewater on the skin. It was that exact spa visit where I also learned about vitamin C serum. See, Honey, good things come from gifting your wife with a spa day (hint hint). During my facial (yep, remember that facial?) the esthetician used a fragrant product on my face. The aroma of the product was so uplifting and refreshing that I had to ask about it before leaving the room. As it turns out, the uplifting and soothing product was nothing fancy or complicated, it was simply pure rosewater. Upon further research into the product, I learned that rosewater can be used to make a facial toner, which then got me thinking, Hmmm..I can go to bed each night and go throughout my days smelling like a freshly-picked flower? Of course, I also factored in the important points about rosewater being soothing and hydrating for the skin. My thoughts weren’t all about smelling good in the carline ;). I’ve been using my rosewater toner for about two months now (experimenting between homemade rosewater and a store-bought option), and I hate it. Just kidding. Totally kidding. I wouldn’t share a recipe around here that I hate. Okay, here’s the truth: I haven’t noticed much of a difference between using the apple cider vinegar or rosewater toner. I’ve truly enjoyed both products, and have experienced good results with both toners. From a scent standpoint, I’m enjoying the uplifting scent of rosewater vs. the pungent scent of the apple cider vinegar (which dissipates after a few minutes). For now, I’m sticking with a rosewater toner, but I may return to apple cider vinegar in the future. 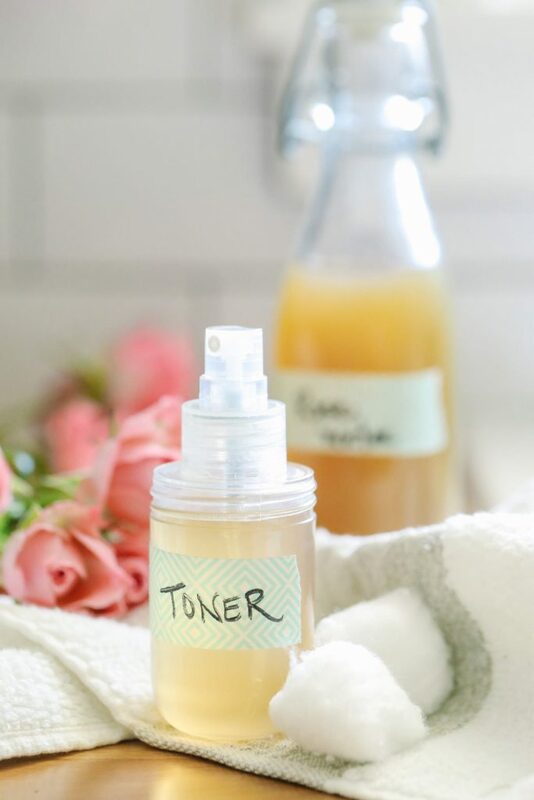 The apple cider vinegar toner is much cheaper to make than the rosewater toner, but I’m happy to share that I’ve discovered there’s a pretty simple way to make a do-it-yourself version of rosewater at home. And that, my friend, is what we’re going to do today…boil/cook roses to make rosewater, and then make a facial toner. Who’s excited?! 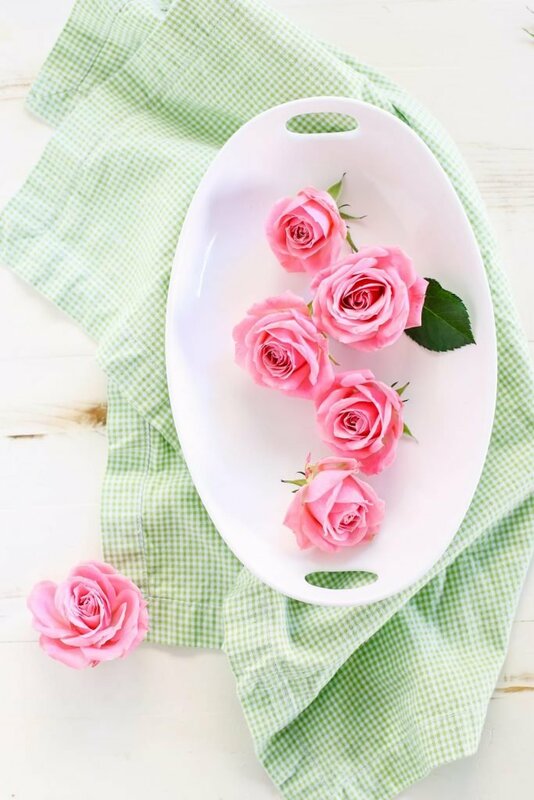 If you'd like to make rosewater: In a saucepan, over medium-high heat, bring the rose petals and water to a boil. The petals will float, so I recommend placing a smaller lid on top of the roses during the heating/cooking process. This will keep the petals submerged in the water. 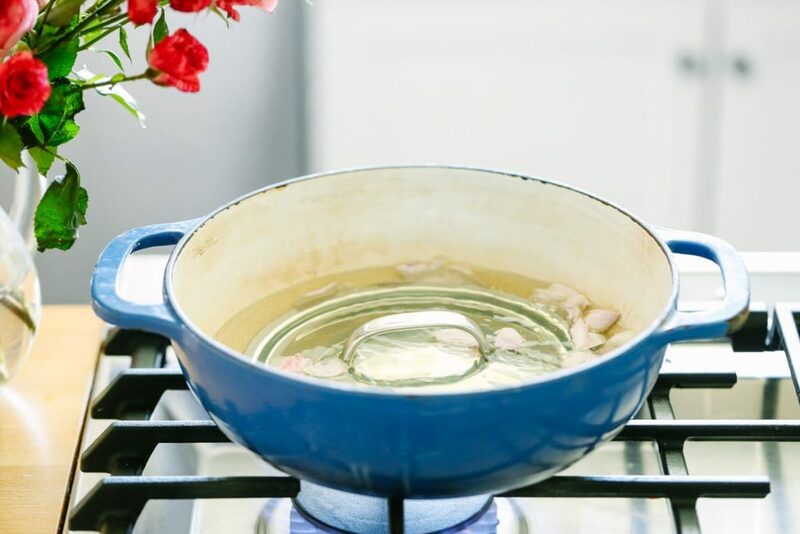 Once the water begins to boil, reduce the heat to a simmer (lowest heat possible). Steep the rose petals in the water for about 45 minutes. You can steep the roses for longer, but I recommend turning off the heat and just letting the petals rest in the water versus using the heat. After steeping the roses, strain the rosewater from the roses using a bowl and cheesecloth (or a fine mesh sieve). A large coffee filter may also work for this step, although I haven't personally tried this method. Discard the petals. The water can now be used to make a facial toner. To keep the rosewater from spoiling, I freeze my rosewater in 1/4 cup measurements, using freezer-safe mason jars or baggies. This allows me to make several batches of rosewater toner as needed. 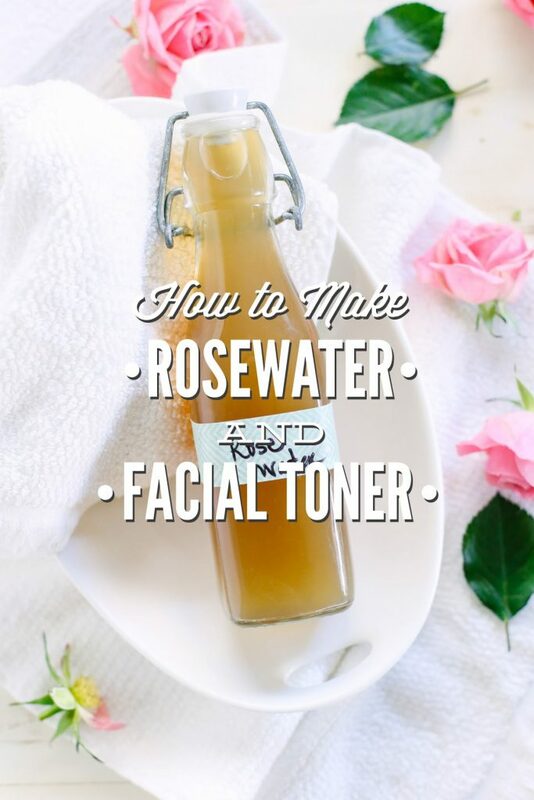 Rosewater Toner: To make a facial toner, combine ¼ cup witch hazel and ¼ cup rosewater in a jar or spray bottle. Spray or apply a small amount of rosewater toner on the cotton ball (or directly on your face), and then wipe your face with the cotton ball. I use this toner in the morning and at night, after using my cleanser and before using my vitamin C serum (at night) and oil moisturizer. *Rose Petal Note: Source roses that are organic and haven’t been sprayed with pesticides. I soak the rose petals in water (just like I do with fruit or lettuce) to remove any dirt or surface substances, and then rinse the rose petals before boiling them. Using a produce spray is another option for washing the petals. If you can’t find organic roses, I’d recommend purchasing store-bought rosewater to make a toner. I first started using my rosewater toner with a store-bought rosewater, and I really enjoyed the product. My goal for this recipe is to give you the option to make rosewater, if desired. Both store-bought rosewater and homemade rosewater (either steamed or distilled, see note below) will work in the facial toner recipe, which is the end goal! *Rose Otto Essential Oil Note: Rose essential oil is a very precious oil and very costly ($80 for a tiny bottle)!! I purchase Aura Cacia Rose Otto in Jojoba Oil, which is diluted with jojoba oil (which is a great skincare oil) to make this oil more affordable. The oil provides an amazing scent to the homemade rosewater (steeped rosewater isn’t very fragrant). This is a personal choice, but right now I can’t spend $80 for a tiny bottle of 100% undiluted rose otto essential oil, so this is the next best choice for me. If you’re using a store-bought or distilled rosewater, I wouldn’t worry about adding this essential oil, unless you already own it. My recipe uses a steeping method, which results in a colored rosewater. Technically, store-bought rosewater is distilled, which results in a clear, fragrant rosewater. Steaming doesn’t result in such a fragrant liquid, but I’ve been pleased with the final product so I continue to use this method. If you’d like to distill versus steep your rose petals, I recommend checking out this easy tutorial video. I love the ACV toner, but can’t wait to try this one. I will use the carrot seed oil or Lavender as my eyes are very sensitive to the tea tree oil. Thanks for all your DIY beauty products. Sounds lovely! 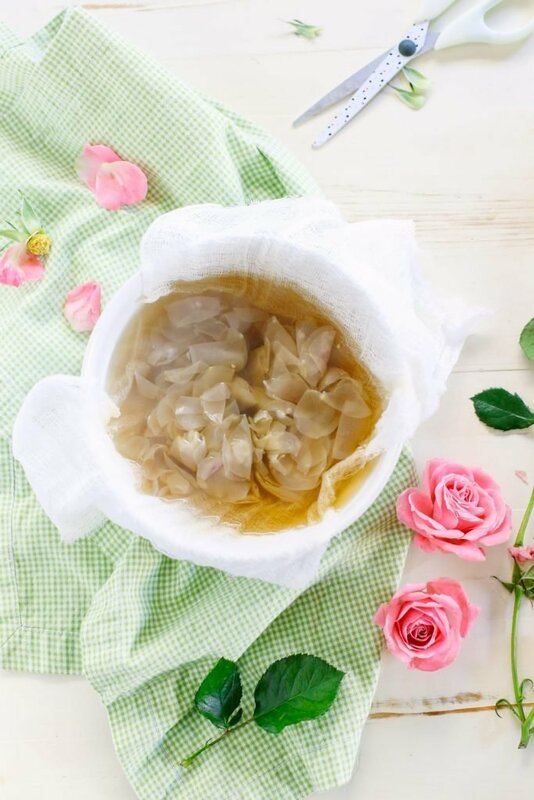 Can you use dried organic rose petals or only fresh? Hey Lea, Yes, from my research, you can use dried organic rose petals! Let me know how it goes! Love this post. I have steam distilled dried organic rose petals to make rose water (technically rose hydrosol) and I was very successful! I recommend finding a local store that offers dried roses in bulk or going to Mountain Rose Herbs. I did the same process with lavender buds, and combined the rose and lavender hydrosols with vegetable glycerin to create a moisturizing toner. My skin feels great, looks clear and I barely need facial moisturizers! 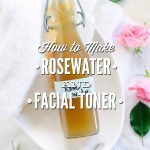 I’m really enjoying your blog and love your home made skin care I’ve been using rose water toner for many years but never ventured to make my own (I usually mix ready made rose water and witch hazel) I’m going to give it a try. I usually put a few drops of glycerine in my blend and think that I will try frankincense next time as it is good for mature skins. Next thing to try will be your foundation recipe. You can add glycerin for the moisturizing properties and also to keep the EO from evaporating in the water-based solution. I love your website and all your content! I am wondering where I can purchase all of these lovely bottles for the DIY products? For example, the bottle you store your toner in? etc. Hey Dorin, Thank you so much! I’m so glad you’re enjoying the blog! I purchase most of my bottles from Target (the dollar section is AMAZING!! ), HomeGoods (the toner bottle came from there), and Amazon (Weck and Mason jars). You are awesome. But i have quite a few problems with my skin. I have got pimple and pimple marks all over my face, back and front and even on my legs and hands.. its so horrible i hate it.. can you please help me here.. nothing suits me much apart from lemon rose water and glycerin.. ???? the doctor said its because of my hair which over time have fallen from 1 lakh to 1 thousand ???????? .. i tried your homemade honey face wash but it didnt help.. can you suggest me something..
Hey Aysia, My concern is just pesticides on the roses, which would be transferred to the water. If this isn’t a concern, non-organic roses may definitely be used. Hey Jamie, That’s so sweet! Yes, the finished product should be refrigerated, depending on what you use. At room temperature, rose water (via this recipe) will only last about a week. Rose water from the store will last much longer. If you’re using the rosewater tutorial, then you’ll want to store it in the fridge. 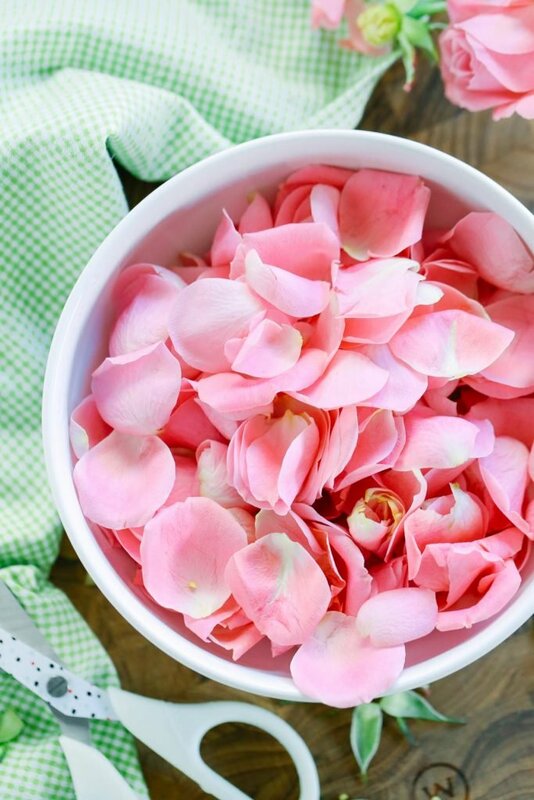 If you’re using store-bought rose water, room temperature is fine. How long does his last? The shelf life? In the fridge, it will last a few weeks. On the counter, it will last about a week. I like to freeze homemade rosewater, and only pull out as much as needed for a short period of time. My witchhazel says it contains 14% alcohol. Is that okay to use or would it dry out the skin? Hey Serendipity, I would try a small spot-test, possibly on my wrist, for a few days. I like to purchase the alcohol-free witch hazel (Thayer’s brand makes a good product) for my sensitive skin. Another option is to use apple cider vinegar. hi, i’m just curious about how is it still packed with vitamin c event after cooking the roses since vitamin c does not resist to heat? Hey Cycy, That’s a very good question, and one that I don’t have a well-researched answer for at this time. You could use the distilled method (video linked at the bottom) to prevent any issue. Hey kristin i love this diy. I was just wondering if i could use tea tree oil as the essential oil or do you think thatll be too harsh? Thanks so much! Hey Roma, Definitely! Tea tree is a great oil for the face. Hey Elba, You can use rosewater by itself, without adding anything to it. Or use just a small amount of ACV (not as much as the witch hazel). Lemon essential oil would be a lovely addition. I’d use the lemon EO version only at night, since the lemon isn’t a great mix with the summertime sun. Thanks a lot Kristin, have a good day ? 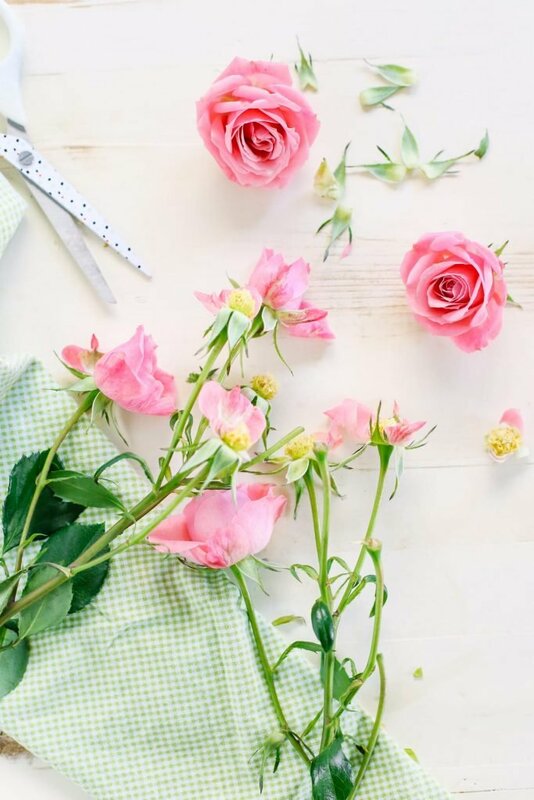 hello, been doing a lot of reading on rose water but there’s still some unanswered questions on a few of the websites I’ve found. can the steeped rose water be used as a facial toner by itself, or does it need witch hazel added into it? is it also just as affective by itself as a toner or is it better with the witch hazel? Hey Farrah, You can use rose water on its own. It all depends on what feels better for your skin. Yes, I believe so. Playing around with it and see if you like just rose water, or need something more as an astringent (like witch hazel or apple cider vinegar). okay, thanks much 🙂 cant wait to try it out today! I tried your cleanser recipe and its wonderful! That all sounds lovely, Lyn. Thank you for sharing. Hi. Thanks alot for your DIY toner. Just a quick question. Can I add jojoba oil in this toner? Hey Shanthi, Yes, you could :). Hi Kristin! 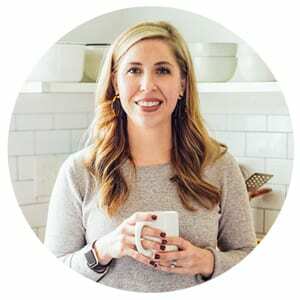 Thank you so much for sharing all of your wonderful recipes with the Live Simply community. I’m really excited to try this one! I noticed in a response to a comment that you think this toner could be used without the witch hazel but recommended keeping WH if the user needs something more of an astringent. I have tried my hand at researching determining if one should use a gentle toner vs astringent, but I feel more confused now that I did the research! So I turn to you! 🙂 What skin types usually find a gentle toner best?.. Who usually needs the astringent properties of WH and the like? (Though I will probably test both options for my skin with this recipe since I’m sure that’s the only way I can find out for my own skin.) Thanks in advance! Hey Ciera, A toner is used to balance the ph of the skin after cleansing, at least that’s what I’ve read from my research. The only difference is that an astringent is usually alcohol based (or another chemical). It’s really just up to you as far as which you go with. This is lovely! Just a thought, can we keep the petals in the toner or will it soiled? I am not sure if you’re still commenting on this but I really wanted to add something. I love this recipe but I also wanted to add the reccomenation of leaving the LID on the pot when steaming the flowers. You lose SOOO much of the rose essence when they steam flys away. Thank you for sharing, Daphne! Hi! I tried making this recipe and I used store bought pure rose water and witch hazel . I couldn’t stand the smell at all so I added lemon essential oil to it which didn’t last very long. So , I was wondering how I can make the smell of the essential oil last . Thank you ! Hey Shahad, There’s no way to disguise the smell of rose water–it’s a very fragrant ingredient. I don’t think an essential oil would be powerful enough to overpower the scent. I think the best option here is to not use rose water. It’s a lovely post! Just want to check with you what sort of glycerin can i add into this toner? And noticing that you put oil with rose petal water, thus the oil would float up all the time and you will need to give it a shake everytime you use them? Hey Megan, Vegetable glycerin is my choice. If you add the essential oil to the glycerin, give it a swirl, and then add the water it acts as somewhat of an emulsifier. You’ll still need to shake the bottle before use. This was so helpful! Working on my first batch now…. thank God I found your blog! Hi, does home made rose water and toner need to be kept refrigerated? Please advise proper storage for both. Thank you! Hey Jess, Yes, refrigeration is best for the water. And making small batches of the toner is best so you can make as much as needed for a short time. Just a heads up, bergamot is a sensitizing ingredient and can cause photosensitivity.